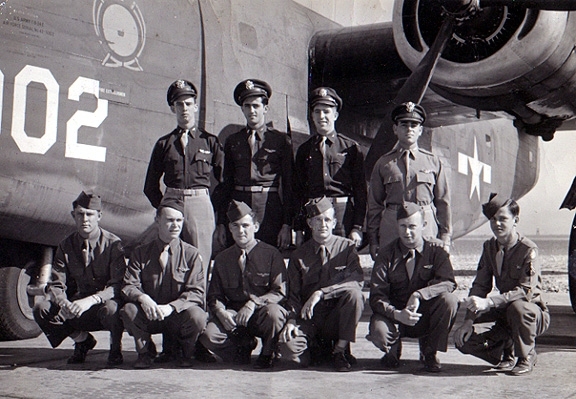 Alva Hoover crew was assigned to the 513th Squadron. This picture was taken during training. 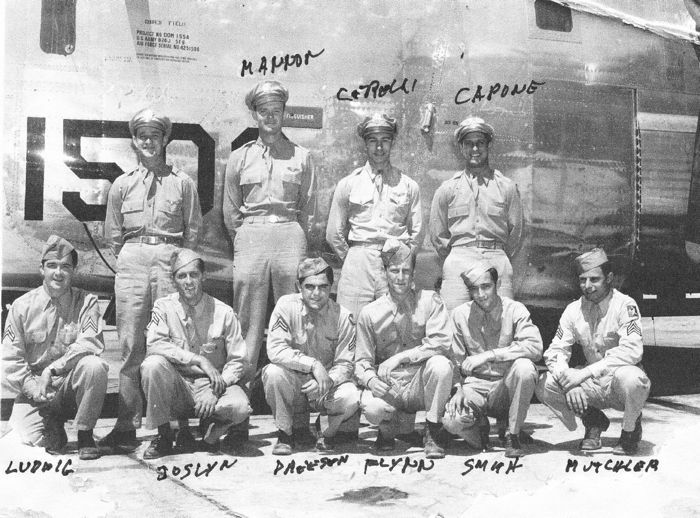 Back row: Lt. Alva M. Hoover - Pilot, Lt. George E. Kitchel - Co-Pilot, Lt. Carl O. Diamond - Navigator, Lt. Joel Halpern - Bombardier. Front row; Sgt.Chaffin - Engineer, Sgt. Burgraff - Armorer/Gunner, Cpl. Seales - Ball Gunner, Cpl. Motely - Top Gunner, Waist Gunner, Sgt. Filler - Radio Operator, Cpl. Debeljak - Tail Gunner. This photo was taken at the training facility. "The second photo down has been incorrectly labeled in pen, and as such was most likely reported incorrectly in the accompanying text. The man with "dressen" inked below him is Richard Mutschler(third from the left) I have no idea who the man with "mutchler" scribbled under him is." We are going to assume therefore that "Mutchler" is "Dressen." 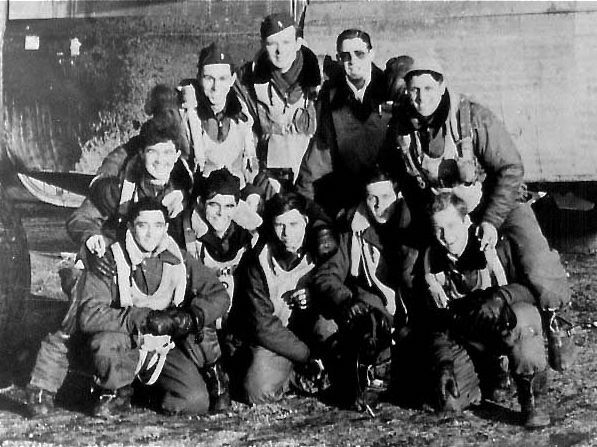 This crew picture was taken following one of their missions. The crew composition is different. "The third and final photo on the page also has my grandfather and this gentleman mixed(perhaps owing to the virtue of the first photos mis-labeling). My grandfather is the second from the left kneeling. I have my grandfathers flight journal as well as many photos i would be happy to share, but i respectfully ask that this error is addressed. Thank you in advance."